Please note that the content of this book primarily consists of articles available from Wikipedia or other free sources online. Queenie Dorothy (''Queenie'') Leavis (7 December 1906 17 March 1981), née Roth, was an English literary critic and essayist. Born in Edmonton, England, she wrote about the historical sociology of reading and the development of the English, the European, and the American novel. She paid particular attention to the writings of Jane Austen, George Eliot, Herman Melville, the Brontës, Edith Wharton and Charles Dickens. 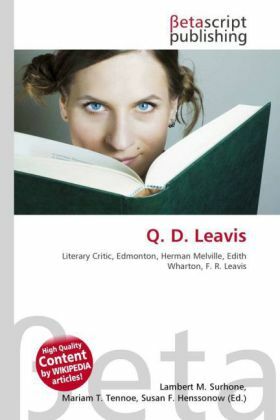 Much of her work was published collaboratively with her husband, F. R. Leavis. She contributed to and supported as an editor Scrutiny (1932-1951), an influential journal that claimed to promote a stringent and morally serious approach to literary criticism. Her collected essays which include some previously unpublished writings are available in three volumes. The mathematician Leonard Roth was her brother.